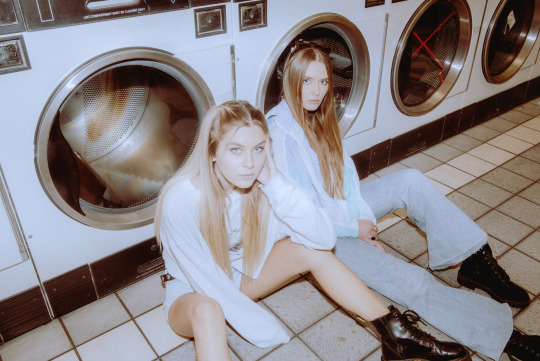 Bahari, the piping hot pop duo who have opened for the likes of Selena Gomez and Birdy, is growing along with their fan base. Composed of members Ruby Carr and Natalia Panzarella, the two base their sound around intricate harmonies and lyrics detailing the realities of their lives as young women. After starting off with a squeaky-clean bubblegum pop sound, they’re embracing a darker side of their artistry–one which is more reflective of their current state of mind. We sat down with Bahari to get the scoop on their darker sound, getting recognized in public and their fans in Africa. OTW: Let’s start with where you’re both from! Natalia: I was born in Nashville and I moved to Manhattan Beach when I was eight. OTW: And “Bahari” is a Swahili word, right? R: Yes, it means “the ocean” in Swahili. OTW: So Ruby, is English your second language? R: It’s my first language, but when I was little I would speak both. I don’t know which came first, but I would speak them both fluently when I was a kid. My parents would speak English and all my friends would speak Swahili. OTW: So how did you guys link up? OTW: I mean, that was wildly successful, so pretty great first try. How did it feel to release it and then got the response that you did? R: We didn’t push it at all! And nothing happened with it for a while. N: It was on The Royals, that was fun. R: And it’s crazy because we put it out so long ago but it’s continued to grow. OTW: You guys have talked about transitioning your sound to an audience more your own age than the younger crowd. What challenges have you faced with that change? N: I think one of challenges was that we had this really good song that we wrote, or we thought it was really good (laughs), but it was called “Fucked Up.” And they were like, “Oh we don’t really want you guys to release that because you guys are really young, and we don’t want your audience to get thrown off.” So we were like, “Okay, I think we can actually transition slowly and become more edgy, or actually just be ourselves.” We’re not trying to be edgy. We do smoke weed, we do go out, I mean we’re 21 so it’s different now. R: I think also, a huge part of the transition of our music was based from being on tour and all of the song we had put out before, we had never been on tour with. So watching how some songs transition live, we started to take that into our writing. You start thinking about performing, but we weren’t really thinking about that when we were writing the songs before because we’d never been on tour. So I think now the music is real and how we want to be perceived live and everything. OTW: So you all have opened for Selena Gomez and Birdy, tell me a little bit about meeting them! Were you fans before touring with them? R: As a piano player I grew up obsessed with Birdy to the next level. I used to watch her videos on YouTube singing, and I think that’s how I decided that I wanted to do this. I couldn’t sing the songs that she sings because she’s so impressively good. So that being our first tour was like wow, and she’s super talented so getting to stand and watch her with everyone in the audience’s jaws dropped was just like, “We wanna be like that one day.” It was a good start because we went straight from that to the Selena tour, so we’re grateful we did the Birdy tour first because otherwise we would have gone from playing small shows in LA to playing arenas. So the Birdy tour definitely gave us the head start that we needed. N: And the different audiences were really cool. In the Birdy crowd everyone was more into our lyrics and would come up to us after and say, “This song really meant a lot to me,” and that was cool to get from a smaller crowd. But when we sang “Reasons,” one of our songs, people put their flashlights on for an arena show at the Revival Tour and we were all on the verge of crying. R: Especially opening for someone at such a big level makes us want to get to that level ourselves. Watching Selena’s fans, and the way that they love her and their relationship with each other is so insane, and we’re really inspired to do that one day. OTW: I totally remember being glued to her “Skinny Love” cover when I was younger. OTW: You guys are coming out with an album! Tell us as much as you can about it. R: We’re kind of perfectionists with our music, so I know we’ve been saying that we’re putting out an album for a really long time but we want to make sure it’s exactly how we want it to be before we put it out. N: Right, because we are transitioning to a new sound, but the singles are a taste of what we’re going to be doing in the future. R: And what’s hard about writing for an album is say we’ve written 12 songs that we like, we continue writing all the time because it’s a thing that we do for ourselves generally. So let’s say we finish it, and then we’re like, “Ugh I really want this to be on the album too!” Then we have to figure out which one to take off and it’s just a long process. But we’re really excited. OTW: Obviously there is a content change with the lyrics, but how would you describe the difference in your sound now in contrast to your earlier music? R: I would say still relatively electro-pop. R: I think it’s hard to tie music down to a genre these days because so many genres have moved into each other unless it’s something really specific. So, if you were to describe it by genre I think it’d be the same, but the instrumentation has changed because we’re sitting there making it ourselves. OTW: When you write songs, do both of you always touch every song or does it differ? R: We’re so close, it’s kind of weird. We can write about each others’ experiences really well. Like Natalia and I went through a breakup at the exact same time, so we all wrote about it together. OTW: Have you guys been getting recognized on the street? N: We did a little bit after the tour! R: It happens when I go back to South Africa. I was just there, dealing with a lot of Visa issues, and I got stuck there for three months. And it’s crazy because I left there about five years ago, but I had friends there and went to school there. I talk about being from Africa a lot, so it was cool to go back and see that there are so many people that I don’t even know that knew about us and our music. And I was like wow, that is really cool. OTW: Finally, who are your Ones To Watch? R: Tanarélle. We played with her at a show recently and she’s amazing. She has this song called “Boys Like You” and it’s a great one. N: Charlotte Lawrence obviously, she’s our friend. Harry Hudson is great as well. And Lennon Stella has been my new obsession. Her voice is so crazy. August 30, 2018 Enter the '70s with electro-pop trio Bahari. July 16, 2018 Who doesn’t love a good female power trio?